An informal 160km end of season cycle ride around the Pisa Range is the inspiration for a new three-tier classic one day event on February 22 2014 flying under the flag of La Pisa Ronda. Event Directors Geoff Hunt and Pascale Lorre of Southern Traverse fame have devised the challenging race which has attracted headline sponsorship from Southsure Assurance Ltd.
Queenstown, New Zealand (18 March 2013): Some of the world's top mountain biking stars are heading to Queenstown this week to test their skills at the resort's annual Bike Festival. The 10-day Queenstown Bike Festival (22 March - 1 April 2013) features more than 25 events ranging from recreational rides, social events and the Tour de Wakatipu to the extreme downhill races and freestyle events that have attracted the sport's big names to the lake and alpine resort. The Queenstown Mountain Bike Festival (March 22 - April 1) events' line up is stacking up to be the perfect way to showcase not only some of New Zealand's and the world's top riders but also a community spirited festival with a medley of social and family orientated events. The festival's headline events are the Outside Sports Juice Lubes Super D, a six hours non-stop tag team or individual mountain bike race; the two day Vertigo Bikes Dirtmasters Downhill held on a challenging three kilometre course in the Ben Lomond Forest; the Teva Slopestyle, a heart stopping display of bike acrobatics in the Ballarat Car Park; the Rockn'Roll Enduro mountain bike race based on Coronet Peak; the New World Tour de Wakatipu, 36km or 45km ride from Arrowtown to Chard Farm, and the R&R Mega Avalanche, a marathon style event that mixes gravity-assisted excitement with high levels of fitness. 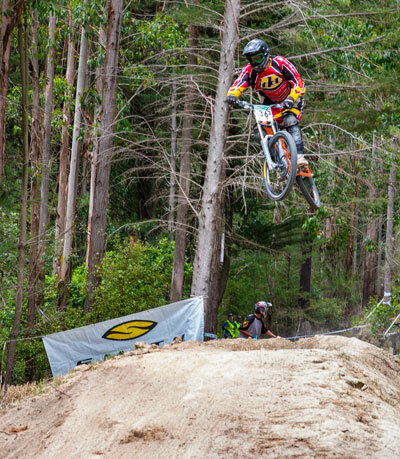 Returning once again to the Queenstown Bike Festival line-up is the Iconic Vertigo Bikes Dirtmasters Downhill. This thrill and spill encrusted downhill race has become a firm favourite and an event local competitors and those from far and wide come to test themselves in. Starting at the summit of the Queenstown Bike Park, and with the support of the Skyline Gondola, the course designed by local downhill race designer guru Blair Christmas takes in the best the bike park has to offer. One of the headline events of the Queenstown Bike Festival, The New World Tour de Wakatipu continues to be a showcase for the freshly completed Queenstown Trails. Held for the 5th year, and with upwards of 800 riders of all abilities competing, this off road race and fun ride has grown to become one of the best loved mountain biking events in New Zealand. Making its third consecutive appearance in the Wakatipu - The Queenstown Bike Festival is back, bigger and better than ever. Running from the 22nd of March through to the 1st of April 2013, the ten day festival is packed with events for both the casual weekend warrior through to the hardened pro. Alexandra rider Shaun Portegys completed 19 laps in the challenging Patagonia 8hrs@Jacks mountain bike event at Jack's Point yesterday to win the individual open men's division. The multi-lap relay mountain bike event is back at Jack's Point near Queenstown for the third time on Saturday 8th December with a focus on team camaraderie in one of the region's most spectacular locations. Race Director Geoff Hunt says 8hrs@Jacks is inspired by a demand from elite and recreational mountain bikers for a unique endurance event in the Wakatipu.